A little slice of heaven sweetly tucked away on the popular Surf Spot of Roselle Beach. Surf, Kite board or body board, we have waves for everyone ranging from beginner to advanced. 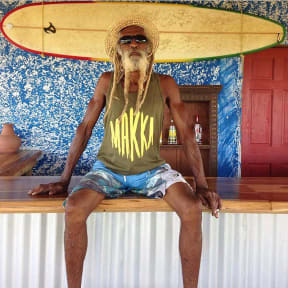 Jamaica's Eastern Outpost for good food, cold drinks, good waves, good music & chilled vibes. 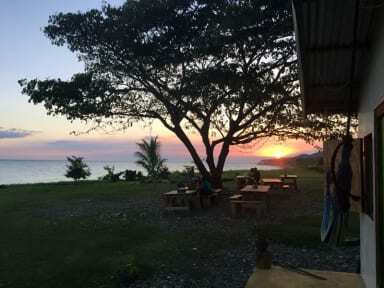 Enjoy our daily Bon Fire with the beautiful sunset as your backdrop. We are located only 45 mins from Kingston, the biggest city in our area. We are located in front of the beach, where you will able to enjoy the best waves and sun of our area. In addition, our restaurant offers glorious seafood such as fresh fish and lobster, our famous Long Boarder burger among other great dishes! We have different types of bedrooms to satisfy the needs and wishes of our guests and travellers. In addition, we have several common areas where the guests and travellers will be able to get together and exchange past experience.